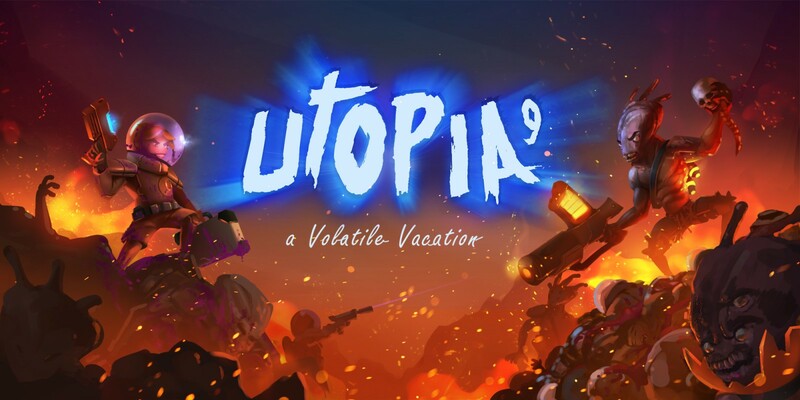 UTOPIA 9 – A Volatile Vacation is a top-down arcade-style shooter from developer Whalegun with similarities to other top-down arcade shooters and even has some FTL moments to it. You play as someone looking hoping to have a nice and relaxing vacation on the planet UTOPIA 9. Trying to feel at ease with the music he has started playing, unfortunately, while changing the stations he is dumped into a mutant-filled wasteland where he needs to fight and make it to customer service to finally complain about his horrible stay. During your vacation, you encounter multiple levels of enemies, from the basic and easy to kill mutants, to big armored ones. You’ll also find many guns in order to kill them, such as your basic pistol, a penetrating laser pistol, a harpoon, and a split pistol. As there are multiple types of weapons there are also multiple types of ammunition, which are all collected from ammo crates which will randomly drop from enemies. To flesh out your arsenal you can acquire a multitude of melee weapons, such as your basic suitcase, and progress to a sword and chainsaw. You can also obtain armor and this comes in three tiers. Basic armor will absorb up to ten HP of damage before breaking, while power armor will absorb thirty. Finally, there are gadgets such as your camera’s flash, which can stun or even form amazing black holes. True to the nature of the deadly weapons you’ll acquire if they happen to fail at the worst time, when you die you can get revenge on your next one as the mutant who killed you will grab your gear and tune into a Nemesis. This creature was born where you died from your last run and will be equipped with whatever you had on at the time. Should you beat them, you’ll be able to grab all that gear right back of them. If you do end up making to the end of a stage, you are greeted with a boss encounter and their customer service representative. This is things will get hectic as many enemies keep spawning and you can’t flee the rockets firing at you. As you deal damage to the representative, he’ll go through stages where the first phase is relatively easy, and then the next phases continuously add more enemies and obstacles to avoid. While playing you will level and when a new level is successfully completed, the people in the world will dispatch a playable tour guide who is armed with an umbrella. The leveling up system reminds me somewhat of FTL in many ways, but you can see what types of weapons, health, and armor are going to in the next area where you will continuously unlock more of the map. All levels have at least one building in them, being a small building with only a few enemies, to be a large building. Each building will have a chest in it that will hold one item per player. Mix crates can contain anything whereas weapons crates will have one specified weapon from the level select screen. Oddly enough, when controlling your character there is a jump command, but it never really is used which makes no sense as to why there is even a jump. The controls are all quite intuitive and cycling through weapons can be done rather quickly. You’ll be aiming in all directions with the right analog stick while moving with the left like many twin-stick shooters, but you just have to keep an eye on your ammo reserves. It’s easy to navigate through areas as they are largely linear, except the occasional small areas off the beaten path. As you kill enemies, you’ll be able to pickup Soylent and use it gain experience. When you finally collect enough you can mutate and pick certain buffs to aid you, including more ammo crates giving health, more health, stronger weapons and much more. While UTOPIA 9 doesn’t have s solid story-line when you make it to the Star Ferry Airport, you’ll see messages written on the walls about Soylent being poisoned which leads me to believe that the workers you are fighting now were once regular people. When you die or finish Utopia 9, you’ll get a performance chart to tell you how everything went on that run. This is also how you earn travel points which you can then use to buy upgrades for your next run. These upgrades will also link to multiple in-game achievements which encourage experimenting and add replayability. Something I appreciated about Utopia 9 was the persistent starting area of when your rocket crashes. When you first get to the planet your rocket crash lands and you jump out, but these rockets stay in the starting area through your sessions and playthroughs. It’s purely cosmetic, but it’s a really nice touch of continuity. It’s unfortunate then that it can get very repetitive and going through the same locations and having the same playthroughs can become boring. Overall, UTOPIA 9 – A Volatile Vacation is a fun little top-down twin-stick shooter that while generic with presentation can still be enjoyable. Multiplayer does exist with a two-player mode and is much more enjoyable. It’s fast-paced and has a comical art-style that anyone can enjoy. With intuitive controls and many weapons to play through, I’d say you’re getting plenty of bang-for-your-buck with this offering.